Greetings friends and fellow crafters, LeeAnn here with a brand focus post using IndigoBlu's "Ickle Christmas Tree". I decided to do something different for a change and made an easel card. This card is fairly easy to make, I cut an 8.5" x 11" sheet of cardstock and cut in half longways to be 4.25" x 11". I then used my scoreboard to make it an A2 size card base top folding 4.25" x 5.5". I then scored again on one end at 2.75", this is what makes the easel part. After I made the panel with the Tree, I added this to the lower part of the card base with double stick tape. This allows the card to fold flat for mailing, and rise up for show when it arrives at its destination home. The wood present is there to stop the top part from sliding closed. My background paper is from the October FOTM kit, as is the wooden present. I stamped the image using a green dye ink from my stash, and colored the ornaments on the tree using Wink of Stella and Wink of Luna markers in Blue, Maroon and Gold. The Snowflakes around the tree were stamped also with the green dye ink, and then covered with Nuvo White Blizzard Glitter Drops. 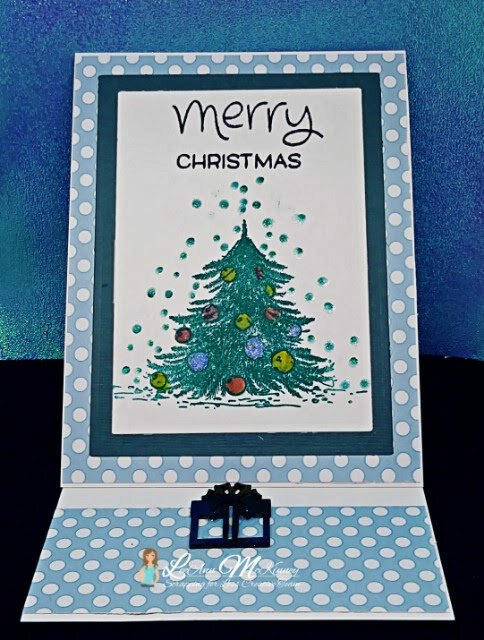 The "Merry Christmas" sentiment is from Lawn Fawn's "Happy Happy Happy" add on stamp set.